Jesus Castillo moved from Sonora, Mexico to Echo Park in search of the American Dream. He was 44. He didn't own a car. In fact he didn't have a drivers license. He simply rode his bike everywhere. He lived in Echo Park and he was a day laborer, taking work when he could and where he could. Through it all, he rode his bike everywhere. A week ago, late at night, he was riding south on Glendale Boulevard when he was hit from behind by a motorist who, according to witnesses, was swerving. He was killed just under the Sunset crossing of Glendale Boulevard. The police arrested the motorist within hours and charged him with vehicular manslaughter and drunk driving. The motorist had a suspended license and was driving the car belonging to his mother. The parents of Jesus Castillo are in town, having traveled from Sonora to visit the spot where there son was run down from behind and left to die in the streets by a drunk driver. Cyclists responded to the news with shock and with outrage and with hard questions. What are we doing to get drunk drivers off the streets? What are we doing to get drivers with suspended licenses out of the driver's seat? How do we get those convicted of drunk drivers into diversion programs that have a real impact? Last week's Office of Traffic Safety Conference in San Francisco addressed this very subject and highlighted the need to support law enforcement with innovations in the judicial programs so that the cycle of abuse can be stopped. The Honorable Richard Vlavianos of San Joaquin showcased a DUI Court program that addressed high risk, multiple offenders and has a documented 50 percent increase in compliance rates and an 80 percent reduction in recidivism among the high risk offenders. What's it going to take for the largest City in the most populated State in the most powerful Country in the world to step up and make public safety on our streets a priority? As for the cyclists, they ride this Friday at 8 pm with a Ghost Bike. 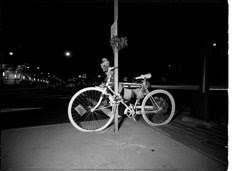 It's a tradition in the cycling community around the world that when a cyclist is killed by a motorist, a white bike is placed at the location to memorialize the tragic and unnecessary loss of life.